As part of my Feast Wisely philosophy I try my best to avoid added sugar. Sugar seems to be added to everything – from cakes and muffins, to sauces and relishes, to bread and pastries. Even many cereals and yoghurts are packed with the stuff. Now I’m not about to start preaching about the dangers of excess sugar – check out David Gillespie’s books if that’s what you want to know. Instead I wanted to provide a simple post to outline how much sugar is in common fruits. My younger self would snack on apples and grapes until the cows came home – I believed, like most people do, that fruit could be eaten in abundance. However fruit is also becoming victim to the ‘I quit sugar’ craze – because of its inherent fructose (sugar) content. Here’s a quote from a good article explaining fructose: In sucrose (table sugar) and in sugary fruits, the fraction that is problematic is the sugar fructose. The other main fraction is glucose, which can be used by all our cells for energy and is the main fuel for life on earth. Most experts seem to agree that fruit shouldn’t be avoided in the same way as foods containing table sugar, but that it should be consumed in moderation. Many reference our hunter-gatherer ancestors – for whom fruit would’ve been a seasonal indulgence eaten in relatively small quantities. 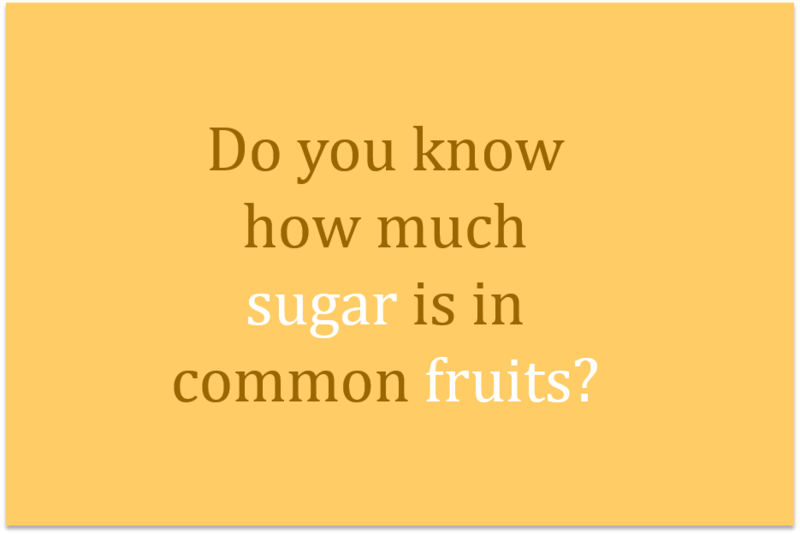 When it comes to fruit the sugar content of varies widely. 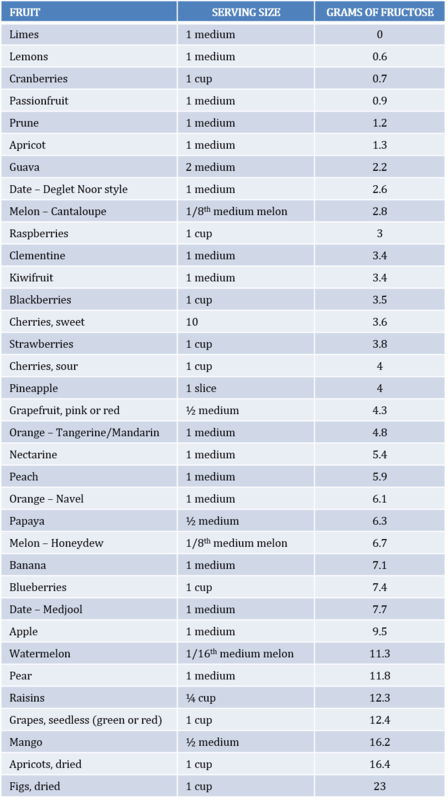 Here I’m sharing data from Doctor Mercola – it is especially usefully because each fruit is listed in the chart alongside a standard portion size. It will hopefully help you make smarter choices. For an even more comprehensive free resource that shows the sugar content of over 2,000 foods (including fruits) check out David Gillespie’s FOOD DATABASE – its based on data from Australia & New Zealand and can be easily sorted by category. Paleo Leap: A good rule of thumb for most healthy people is at around 50 grams of fructose per day. Doctor Mercola: Limit fructose to less than 25 grams per day, from all sources, including whole fruits. If you have insulin resistance, diabetes, hypertension or heart disease, strive to keep your fructose consumption below 15 grams per day. Tags: chart, content, fructose, fruit, how much, sugar. Bookmark the permalink. Wow – now that’s impressive – even I still have sugar in moderation. Well done. If you love bananas then slice one up and add to the freezer – a few slices with nut butter tastes amazing and at least the sugar comes with fibre! And check out my coconut milk ice cream too…..
I’m 13 days into giving up all sugar! Gosh I miss bananas!!!!! I love cake, pastries, biscuits etc even mangoes but I’ve really amazed myself over the last few weeks. Having gotten over the inital headache I now feel fantastic! This is a really interesting post! Thanks so much for sharing this, Laura. It’s a bit of a mental leap to move fruit out of the so-healthy-you-can-eat-it-all-the time category, but I’m trying to snack less on fruit, and especially cut down on dried fruit. When I cut refined sugar out of my diet I find myself reaching more for fruit to get a hit of sugar, and this in itself makes me more aware of the sugar that is in those fruits! Thanks Jennie – totally agree with you – I think it’s about seeing fruit as a treat and instead resorting to snacking on nuts and perhaps veggie sticks instead. And of course I am all for moderation – life is too short to be super restrictive but I find the best way is to listen to my body – it soon tells me if I’ve had too much sugar! I have found that but cutting out added sugars and cutting back on natural ones (such as those found in high fructose fruits), my sweet tooth really isn’t so sweet after all. It’s a fascinating process! Yes agree – I have gone from eating milk chocolate to having 90% dark and now the sweet stuff tastes strange! A little bit of everything in moderation is ok – if you’re cutting out daily sugar kicks then you’re off to a good start! You know, this post is amazing! I always wondered if we could eat as much fruit as we wanted, that the sugar is natural and that it won’t make you fat. I am impressed by the amount of sugar in these fruits, wow! Though, I have one question… is it still better to substitute added sugar food for natural sugar foods like fruits right? I know that too much isnt good, but a moderate amount of fruits per day won’t make you gain weight will it? Stupid question right? Thank you so much for sharing all this info! Thanks for the feedback and yes of course fruit is still better than added sugar packed chocolates and sauces etc – I think it’s just about moderation, so perhaps a mango per day is a no-no but a few pieces of higher sugar fruit per week are good, and of course berries are great for daily snacking! Wow a mango a day – that could have been an expansive habit as well!